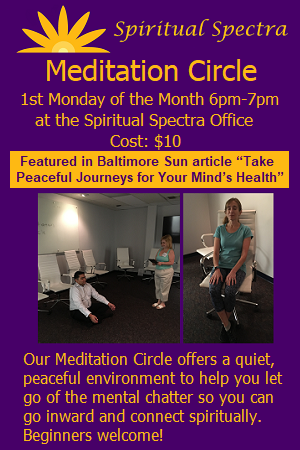 Our Meditation Circle meets on the 1st Monday of the month from 6pm-7pm at the Spiritual Spectra Office 5457 Twin Knolls Road Suite 300 Columbia, MD 21045. Millions of people are coping better with the hectic stresses of life by finding a new peace through the practice of mindfulness meditation. Scientific studies are discovering that meditation can have profound health benefits such as easing chronic pain, anxiety, and stress, improving heart health, memory and cognitive functions, as well as boosting mood. For more information on the health benefits, visit the NIH website and/or this article in Psychology Today. Our Meditation Circle offers a quiet, peaceful environment to help you let go of the mental chatter so you can go inward and connect spiritually. The Meditation Circle will often feature Guided Meditations. Participants will be seated in chairs; however, you can feel free to bring a yoga mat to sit on the floor. Beginners welcome! This Meditation Circle has no religious affiliation, all are welcome! The ticket price is $10, plus online ticketing fee when paying by debit/credit card. You can also pay in cash the day of the event. Intent: We ask participants to come to this event with an open mind and loving energy. Conduct: This is a group event so please be respectful and courteous to our presenter and participants. Spiritual Spectra reserves the right to ask any participant to exit and not return if their rude, surly, negative, disrespectful, inappropriate or harmful behavior interrupts the Meditation process and/or the comfort of other participants. No refunds will be given. There’s a seat waiting for you at my Meditation Circle. Set-up: The room will be set up with chairs for people to sit in to meditate. If you wish to bring a yoga mat or pillow to sit on the floor you may do so. Attire: While it is recommended to dress comfortably for maximum relaxation, you are welcome to come after work in whatever suit or uniform you are wearing.